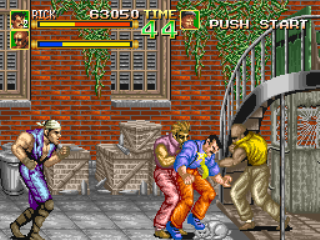 64th Street: A Detective Story is a gumshoe-themed beat 'em up from Jaleco. It's claim to fame is the ability to throw enemies into the background, which breaks walls and reveals items. 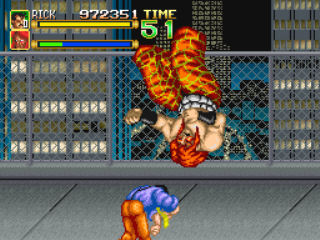 Besides that, it follows closely in the footsteps of Final Fight. Case of the Rich Man's Kidnapped Daughter. My daughter has been kidnapped! I got this letter from the kidnappers. Please rescue her. Rick: Hey, look at this ad in the classified! I think this has got something to do with the illustrious client who visited last night. Allen: You mean that rich business dude? Rick: Yep. The guy whose daughter was kidnapped. Allen: You mean this? This is just a classified ad for a job. Rick: There's an encoded message hidden in these sentences. And I'll bet only certain members of the criminal element understand the code. Allen: I don't see any secret code. Who do you think you are, Sherlock Holmes? Rick: It's not just this one ad either. There are several job ads in here that contain a secret message. This must be a huge criminal organization judging by the amount of money they've spent on ads! Allen: I still don't get it. Where is the secret code? Rick: Read these job classifieds very carefully. Notice the similarity between the sentences in the ads and the sentences we saw in the letter from the kidnappers last night? Rick: Let's get on this case! 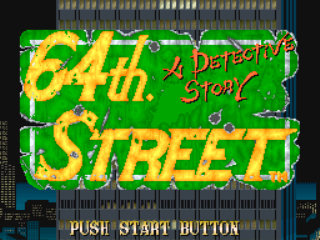 64th Street: A Detective Story is the first brawler from Jaleco. 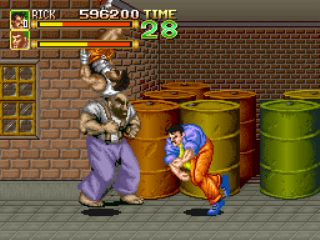 They would go on to develop the Rushing Beat trilogy on SNES, which has similar Final Fight-style gameplay with a few extra gimmicks. One of the items in this game is the ghost from Avenging Spirit, another arcade game from Jaleco. You play as a recently deceased youth who avenges himself by possessing enemies. To unlock Very Easy and Mania difficulties, highlight the options menu, hold A + B on player 2's controller, hold C on player 1's controller, and press start. You can also now increase the number of lives to 9. To play as the same character in co-op, hold down-right + B on controller 1, left + A on controller 2, press C on controller 2, and then finally pick 2-player mode. 64th Street is aite, I guess. 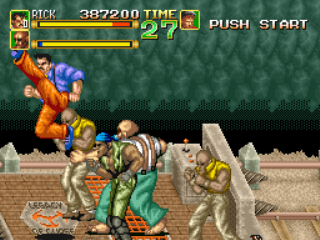 As far as Final Fight knock-offs go, you could do a lot worse. At least it has huge sprites. Its strengths are the throwing enemies into the background gimmick and its goofy personality. The music ain't nothing special, though. 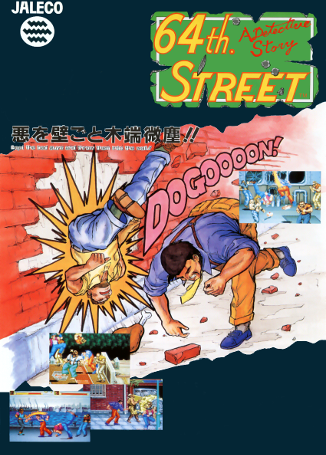 Jaleco would later go on to develop the Rushing Beat series of games.